The most complete guide for anyone looking to gain an understanding of 3D Printing and its practical application in an IT and Non-IT environment. 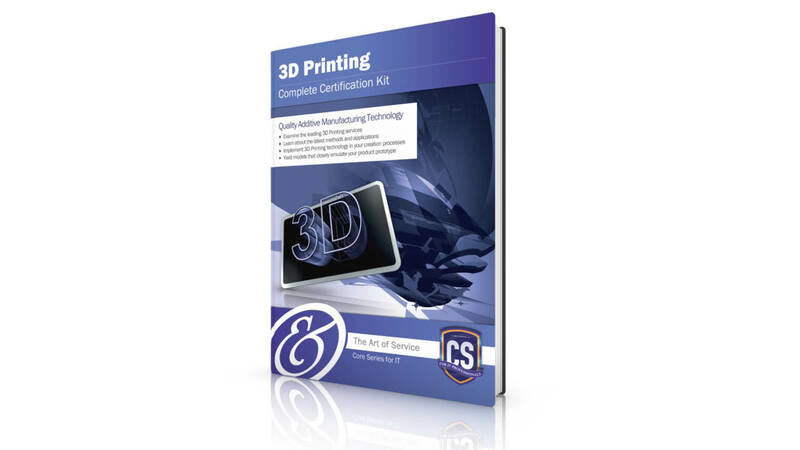 The 3D Printing Certification Kit contains a study guide eBook and online course, and is delivered to you via our eLearning portal, giving you the freedom to access it anytime, whether at home or in the office. The 3D Printing Complete Certification Kit is a part of the Core Series for IT, a series of courses available to help career-driven IT professionals stay relevant in their roles in the I.T. industry. Each course in the core series includes a certification upon successful completion. Examine the latest discovery in printing technology. Explore an affordable, fast, and easy-to-use additive manufacturing technology known as 3D Printing. 3D Printing is a unique form of additive manufacturing technology where a three dimensional object is created by laying down successive layers of materials. Become a valued member of your organization by learning about the history, methods, and processes that encompass 3D Printing as well as the services it provides. This certification validates that you know specific methods, models, and/or tools. This is essential to professionals in order to be updated on the latest multimedia trends, and to add to their 3D Printing toolbox. The Art of Service's introductory 3D Printing training and certification helps IT practitioners develop the skills that are crucial, as businesses embark on this massive transformation. It provides an industry credential for IT professionals to help them transform into the world of 3D Printing. The Art of Service IT Service Management programs are the #1 certification programs in the information management industry. Being proven means investing in yourself and formally validating your knowledge, skills, and expertise by the industry's most comprehensive learning and certification program. The 3D Printing Complete Certification Kit course prepares you for 3D Printing Certification. - Learning about 3D Printing technologies has never been more affordable. - Learn from the Experts. The Art of Service offers education about 3D Printing and 300 other technologies by the industry's best. - Learn the important concepts, tools, and uses of 3D Printing. - Learn about the benefits of implementing 3D Printing in your work place. 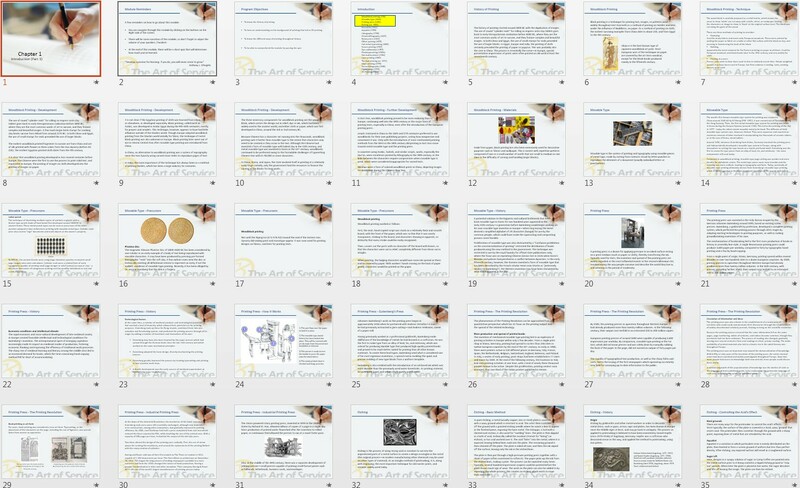 - Examine the technologies used throughout printing history, and how it has evolved. - Review 3D Printing processes, methods, and technologies. - Explore the different types of 3D Printing and 3D Printing services.